Winter Soups | Jake & Sam -- Let's Cook! The weather has been so un-winterlike in San Francisco that it’s been hard to think about hearty stews and robust soups. This past weekend, however, cold weather and rain finally arrived, so it’s time to break out some pulses – beans, barley, lentils and split peas. Here are three nourishing soup recipes that will warm you up, wherever you may be. This is, not surprisingly, an old Scotch recipe. Its appearance is somewhat murky, and barley can be, well, slimey. However, it’s one of those hearty soups that speaks of the pleasures of winter fare at its best. I like to make it with just lamb, onions, carrots, a leek or two and barley, but you can add turnips, parsnips, even cabbage and potatoes if you like to make it a more of a stick-to-your-ribs stew. Put the lamb, thyme, celery and bay leaves in a suitably large pot and cover with water, to which you’ve added a good teaspoon of salt. Bring to the boil and skim off the scum that rises to the surface, continuing to skim if necessary. Simmer gently for 60 minutes then strain, discarding the herbs and setting the meat aside. 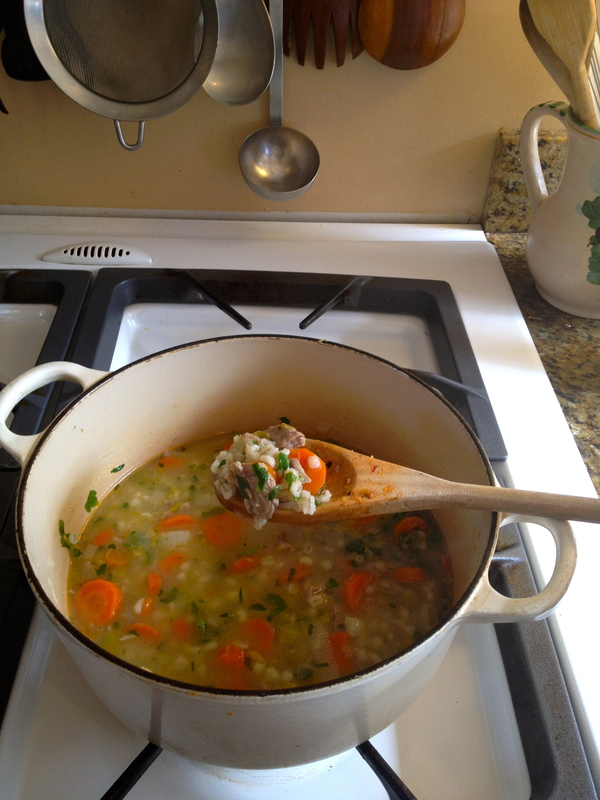 Return the liquid to the pot, adding the barley, onion, leek, and carrots and continue to cook at a bare simmer. Once the lamb is cool enough to handle, remove the bones, chop it and put it back in the pot. Continue to cook until the barley and vegetables are tender (a total of 30-40 minutes since they were first added.) The soup should be thick but not solid. Add more water along the way if necessary. Add the chopped parsley, salt if necessary, a good grinding of pepper, and serve piping hot. After I’d made this soup and Sam had photographed it, it struck me that everyone knows how to make black bean soup, right? Or, if not, you can’t go far wrong following the recipe on the bag of beans. So if I don’t have anything particularly illuminating to add (and I don’t) what’s my excuse for writing about it? 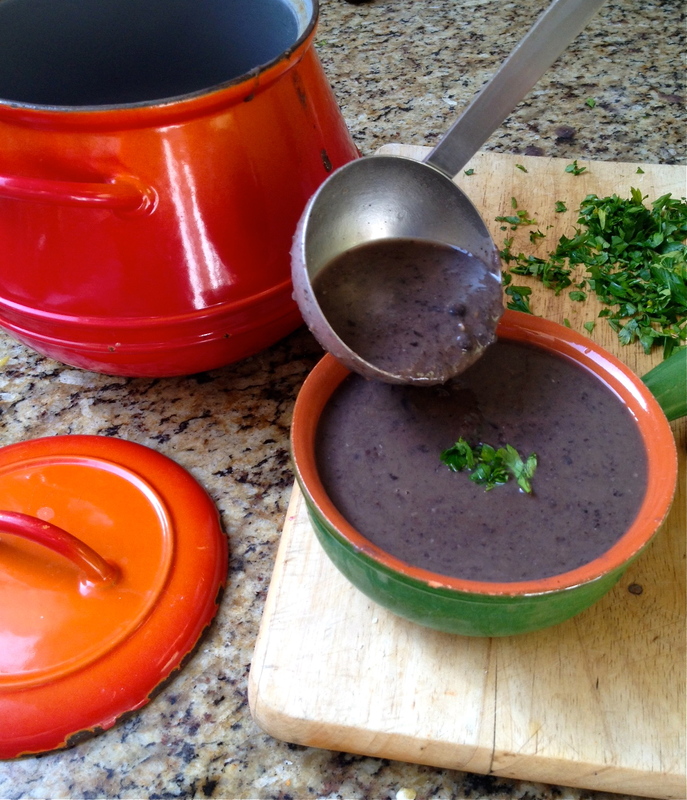 Well, we do have a nice photo, black bean soup is so cheap and cheerful, it’s perfect on a cold, blustery night, and maybe it’s slipped off your radar and you’re happy to be reminded of how simple and easy it is to make. Soak the beans overnight in cold water to cover by 2 inches, or bring the beans to the boil in a large enough pot, boil for 2 minutes, cover and leave for at least 2 hours. Drain the beans. Saute the bacon in a little oil until almost crisp, add the onions and garlic and continue to cook for another few minutes (or if you’re not using the bacon, just saute the onions and garlic in the oil). Add the drained beans, bay leaves, cumin and cayenne, and again cover with water by about 2 inches. Bring to the boil, skim if necessary, turn down the heat and simmer until the beans are just cooked. Cooking time will depend on how fresh (or old) the beans are, anywhere from one to two hours. You’ll need to keep checking after the first hour. When cooked, add salt, the lime juice and if you think it needs to be jazzed up a little, a bit more cumin and cayenne. Put about half the beans and some of the liquid in a food processor or blender and blend until smooth. Return to the pot and mix well with the rest of the beans. Serve hot, garnished with a dollop of sour cream and a sprinkling of cilantro. This is Provençale minestrone, pistou being the local word for pesto. It’s more often an end-of-summer soup made when vegetables are at their peak, basil is abundant, and fresh shell beans such as cranberry (cocos in French) make their brief appearance. I make it year ’round because it is probably my very favorite hot soup, bar none. I am quite rigid about what vegetables to use – leeks, carrots, potatoes, green beans, zucchini and butternut in winter – and then I add canned canellini (often sold as “white kidney beans”) and pasta, cooked separately. In summer I add a lovely ripe tomato (sometimes to the soup, sometimes to the pesto) and fresh shell beans instead of the canned. 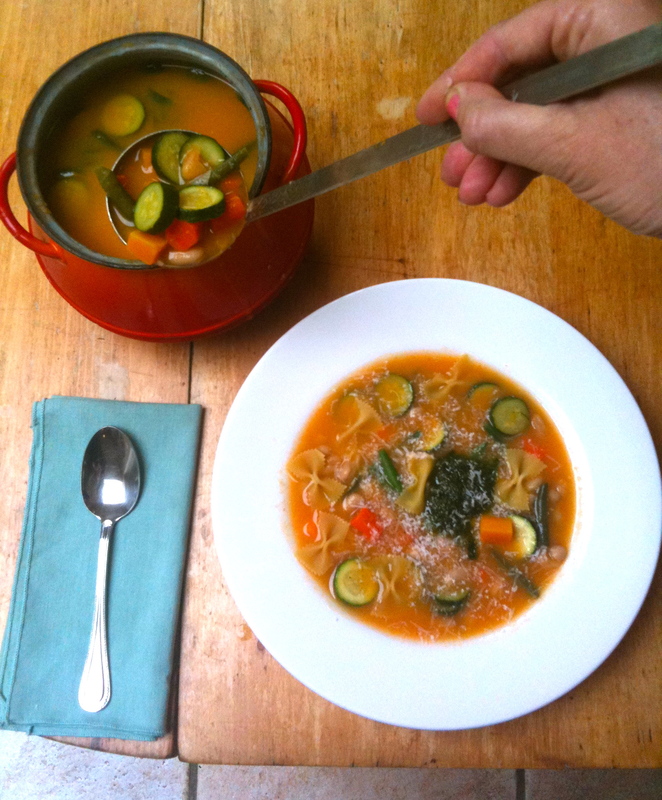 The way I make this and other minestrone-type vegetable soups is somewhat unconventional. I learned it in the restaurant Lou Pastrouil in Nice, when I was cooking around Europe in the sixties. Lou Pastrouil was a simple place in the old town decorated with fishing nets and copper pots. I spent a week there as an (unpaid) apprentice, getting acquainted with the pleasures of Provençale food. In addition to the rustic pork pâté, stuffed sardines, and wonderful mussels for the first course, there were two soups on the menu – soupe de poissons and soupe au pistou. The elderly woman who was the cook showed me how she vigorously mashed some of the veggies against the side of the pot to give the soup body instead of letting the liquid remain, in her words, like dishwater. I have done this ever since, though nowadays with the help of a food processor. It really does make a richer soup. Sadly Lou Pastrouil no longer exists, a busy Bar-Tabac has now taken its place, the aroma of its exhilirating food long gone. Put the potatoes, the two large carrots, and the leeks in the water in a suitably large pot. Salt the water and bring it to the boil. Cook until the veggies in the pot show some resistance to a knife (about 5 minutes after the boil). You’re now going to add the other veggies at intervals so that the’re all perfectly cooked at the same time: First the sliced carrots, then the beans, then the butternut, then the zucchini, then the canned beans, with a few minutes between each addition. This may seem like a lot of trouble, but it really makes a difference to have each vegetable cooked right and not too mushy nor too bitey. Five minutes after the last addition, turn off the heat, and fish out the potatoes, carrots and leeks. Process them (in two batches if necessary) in a food processor or blender with enough liquid from the pot to prevent the potatoes from becoming sludgey. When you have a smooth purée, add it back to the pot and reheat the soup. Cook the pasta separately until al dente and add it to the soup after it’s reheated. While the soup is cooking, make the pesto. In a mortar, pound the garlic with a pinch of salt and gradually add the basil, pounding it to a paste. If you’re using a tomato, add it now and continue to pound. Otherwise add the olive oil progressively until you have an unctuous thick sauce, not quite an emulsion. I leave out the usual parmesan as I prefer to add it directly to the soup at the table. Of course, you can make the pesto in a food processor or blender. But, if you don’t own a pestle and mortar, I strongly urge you to invest in one (preferably marble or porcelain with a wooden pestle..like this one, for example). Using it to make pesto and mayonnaise and salad dressings is a most rewarding experience, not to mention yielding a finer end product. Finally, to serve: Ladle the hot soup into large bowls. Bring the pistou to the table in its mortar, swirl a tablespoon (or two) into each bowl, add grated parmesan, a grind of pepper and prepare to be astonished by its goodness. Like the two previous soups, this one benefits from being allowed to sit for a day. So if you can resist eating it immediately, cook the pasta and make the pesto right before you plan to eat it. Good to hear from you and glad you like our blog. Of course I remember your groundnut stew way back when (30 years?) – that’s when I first learned about it (and that you used A & P hot sauce to spice it up!). You also introduced us to feijoada – a favorite – which we try make every year as Carnival approaches. Would like to blog it but it’s a lot of work and hard to find pig’s feet and smoked tongue – even in SF. Thanks for the tip on adding a few cloves to black bean soup although I have to admit that I think a clove or two goes a long way. But certainly worth a try. I grew up in a family where my grandmother, mother and aunts always had a pot of hearty soup available for lunch, dinner or a hot and wholesome after school snack. My scottish grandmother used to make scotch broth so I was so delighted to see that recipe and will absolutely make in the next cold and rainy day. Somehow I need a little scottish “mizzle” or mist and drizzle to put me in the mood. It looks delicious. Since I always like a new recipe or twist on a recipe I decided to make the Soupe Au Pistou. The soup itself was a lovely light and fresh tasting soup and I especially liked using the potato, carrots and leeks as the thickening agent. I will continue to use that technique in other soups. Adding the Pistou and cheese at the table was a nice layering of flavor and texture. I really liked the fresh pistou and the saltiness of the cheese a wonderful addition. I am sure I will make this soup again. I recommend making this tasty, healthy and easy to make soup. Enjoy!